The following is a preview of a more full write-up. The following is pre-publication information regarding some experimental evidence consistent with this new gravitational theory. As is to be expected, this new way to look at nature has been received by a few people with some skepticism. Hence, we felt it was important to supply additional experimental evidence for this new theory. We say additional, because in past sharings of this new theory we have cited several experimental evidences. Since the gravitational force in the traditional theory is dependent upon the masses of the objects involved and upon the distance between the masses, we have constructed experiments which differentiate between the new and the old. In the new theory, gravitational attraction is dependent upon the energy density of the objects involved. The mass, per the traditional theory, comes in through the density. Fundamental to the new theory is its description of diallel gravitational-field lines going between the objects. These diallel lines carry, among other things, gravitational information, accounting for the attraction between the two objects with their respective energy densities. This information as Einstein predicted travels at the velocity of light. This new gravitational theory gives an explanation for what is observed. We have written a new equation that describes the gravitational force between two objects (the sun and a space probe, for example). The new equation shows that the force is a function of the energy-density of each of the objects involved. The new theory shows that these diallel lines can be modified and/or bent due to energy densities that may be present along the path between the two objects. We designed and conducted an experiment to test this hypothesis. We placed three different energy density objects underneath pendula clocks. 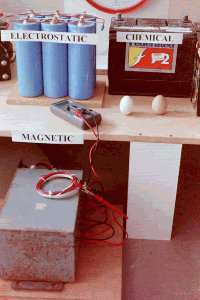 The three energy density sources were chemical, electrostatic and magnetic. To generate these we used a battery, a set of capacitors and a transformer, respectively. In all three cases, the pendula were slowed in their beat. This slowing is predicted by the new theory. The full details of the experiment are explained in the pending paper. There are other relatively simple experiments that can be conducted showing the bending of these diallel, gravitational-field lines. Since the diallel lines define the local vertical, a sensitive plumb-bob, for example, could detect this bending. Experiments are being prepared now using this technique to detect this bending. 1. John D. Anderson, Philip A. Laing; et. al; "Indication, from Pioneer 10/11, Galileo, and Ulysses Data, of an Apparent Anomalous, Weak, Long-Range Acceleration;" Physical Review Letters; Vol. 81, No. 14; 5 October, 1998; p. 2858.